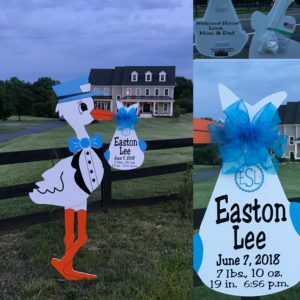 We were excited to deliver our Blue Stork Lawn Sign Birth Announcement to Leesburg Virginia family to celebrate the birth of their new baby!! It’s a Boy! Congrats to the entire family. Are you looking for a stork sign rental in Waterford Virginia? Are you looking for a unique way to celebrate the birth or announce a friend’s newborn baby? Order a Flying Stork with a personalized bundle with the newborns delivery information for the family to keep.